Check out our picture gallery from Shock N Awe 28 at Portsmouth Guildhall on Saturday. 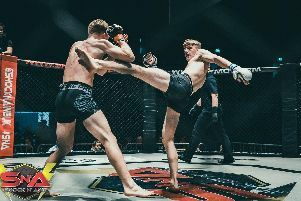 The south coast’s premier mixed martial arts and kickboxing show attracted a superb crown in the historic venue. A bevy of fighters who train at Fratton’s Gym 01 were on the stacked card, with the likes of Cameron Hardy, Elliott Hoye and Gwyn Barry all toasting glory.